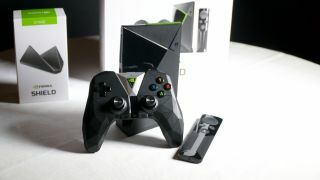 Nvidia wants its new Nvidia Shield Android TV gaming box to be the center of your living room - and your smart home, too. It's being lined-up as a premium Google Assistant experience, controlling smart home devices with a voice-activated controller and including Samsung's "SmartThings" tech. But, if CES 2017 proved anything, it's Amazon's Alexa that is proving itself as the go-to smart home voice assistant, which Nvidia is aware of. Despite the current focus on Google Assistant, the graphics chip specialists are open to integrating Alexa into its Shield devices in the future. "It's an Android TV box, so it it makes sense to focus on Google Assistant at present," said Nvidia's Director of Technical Product Marketing, Sridhar Ramaswamy, at a Shield preview event. "But Shield has always been an open product, so that doesn't mean we've ruled out other platforms. I wouldn't rule out Alexa." Regardless, Google Assistant support will not launch alongside the new console, it's scheduled to land in the coming months as an Android TV update, hopefully before the summer. Alexa could even become an item that homebrew devs bring to the platform themselves since the Shield has become the got-to device for home entertainment tinkerers in general, and this is a position Nvidia is keen to cultivate. "One of the reasons we made Shield an open-source platform was that it allows the device to be rooted. People can sideload what they want onto the device." said Ramaswamy. "If you can do all the stuff, then all the power to you. We know a lot of people are using the Shield as a Kodi box, because it delivers the best Kodi experience. A lot of people are downloading emulators and using Shield for retro gaming. People are side-loading Chrome browser and using it for bigscreen web-browsing too. We totally encourage that - we're not closing you off from any experience." With the Shield standing alone as a premium media streamer, Nvidia doesn't currently have any direct competition in the space, and as a result it's free to try anything its fans cry out for.